Gov. Martin O'Malley in front of a joint session of the Maryland General Assembly in 2010. Gov. Martin O'Malley has signed executive orders to formally recognize two American Indian groups indigenous to Maryland for the first time in the state's history. 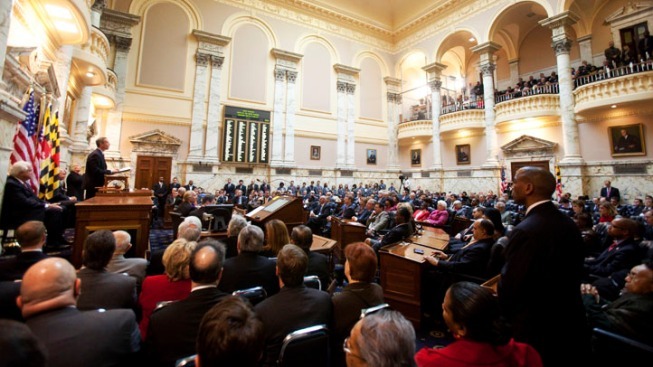 O'Malley, a Democrat, signed the executive orders Monday in a crowded ceremony under the Maryland State House rotunda. The Piscataway Conoy Tribe is one of the groups. It includes two tribal entities, the Piscataway Conoy Confederacy and Sub-Tribes and the Cedarville Band of Piscataway Indians. The other group that's being recognized is the Piscataway Indian Nation. The ceremony follows a process established by the General Assembly to formally recognize American Indian tribes, bands or clans. According to the census, Maryland has 58,000 people who identify themselves as having American Indian heritage.